Nope! Didnt know there is such a thing. Thanks! Have you tried lurking around the community slack? Also a few pages back on the thread some were discussing parameters. does someone is using orange pi? Could be beacuse you havn't set min gain. Which means, the bot will sell/buy everytime a candle is outside the BB brackets. i as a "newbie trader" am really really interested on gdax support as it gives me the possibilities to test the bot(s) without great risk of spending my money on trade fees. so i can run and test my strategies with minimalistic gains etc. does it make any sense ? And it has greater volumes than Bittrex or Poloniex. + Bitstamp trailing stop or to be more specific a stop with shrinking gap (trail will catch up) (the closer i get to my desired price goal the tighter will be the trail) as bitcoin is very volatile my trail must be bigger than 100-150 euros as this candle "swing" is normal. so example i plan to sell bitcoins when price is about 12 000 so i start the trail from 11 000 with 300 euros then from 11500 trail will be 200 11800 / 100 so my "trail" is never too loose and i can profit even small changes / gains without fear that the sudden fall will eat my profit as "trail" was loose. and leave me with trading fees only. it saves up to 1%. GDAX is definitely on our list. Spot orders would have fees though, just limit orders on the book (maker) would be fee free. 4. we are familiar with the mantra send logs screenshots notes to email did that no answer like a month. im certainly hoping something back from the cost-effective company more than thanks dudes well fix stuff after we take small break xmas / weekends etc. arguments that software is in beta and "well priced" at the market does not mean that if my wife sends me to the market to buy tomatoes and i come back with bananas as they were cheaper and nice but somehow useless ? Quick note about VPN(s). The mainstream VPN on Linux is notoriously easy to hack. Please please secure your systems, just because it is sitting on a micro on a desk across from you does not mean it is safe. Take a look at your logs. How many failed attempts at logging into your system have you seen? Have you ever tried logging in and gotten the message too many failed attempts? This is a real bad sign. The normal password arrangement is only 8 characters max. The typical setup is it will accept 5 failures from the same IP before temporarily blocking it but there is also a maximum attempts within a set time frame. What I recommend is setting up an SSH tunnel to your personal localhost and running the VPN from there as well as disabling SSH from accepting passwords, set up your configuration to use your public SSH key only. Just makes me nervous seeing all these posts about VPN and wondering how secure they actually are, if you have internet access to your machine you are at risk. Do what you can to guard your assets. Yes this is a bug which only is present in the demo. We are working on a fix. sorry about that. Can you submit the logs, the exchange you connect to and the selected pairs via mail to support@marginsoftware.de ? You have a log file in your local leonArdo folder. You can just send this via mail to support@marginsoftware.de via attachment and a description of the error. and as Binance, Bitfinex, Bittrex are halting new registrants so the exchanges that have leonardo support are not registering new users and the ones are do not have limits do not have marginsoftware capability just ODD. and they are not suspending new "possible clients " for days ! My point is that if i cannot register to exchange i cannot use Marginsoftware you kinda lock out your clients. BUT THANK YOU! Rene for straight forward answer i really appreciate that. Sorry that i have to say that but, doing "serious trading" on cryptomarkets is nothing you can just to without a distinct amount of knowledge what you're about to do and about to risk. So, i can repeat myself, leonardo is a nice tool to learn the ropes and get your hands wet in this stuff. But, no software on earth will be able to just make you money without you knowing how to use it properly. About your complaint about the exchanges and markets. Well, this cryptocurrency market overall is not only steadily changing - sometimes very abruptly - on the charts, but even on the aviability of systems, exchanges, limits and so on. I've read the news about bitfinex only as someone mentioned over here.. My initial volume i had there (from some years back) and send over on top was something about 0.03 btc or so .... please don't ask me how much it is today since i use leonardo ... but ... well i'm very happy and already upgraded leonardo to the ultra license.. still having significant more than before leonardo. It's just no magical "start and get rich" program. And sadly, the minimum values you need to be able to trade and to see sufficient gains are somewhat higher as last year. But that too is not leonardos fault or the fault of it's developers. leonardo still just works .. with it's flaws (and there are really a bunch of them).. There is overall just no real reason for me to complain .... even if i _wish_ this nice piece of closed source software i bought would just work as intended instead of occasionally crashing or behaving a bit odd sometimes. I can understand your frustration .... but for me .. i paid once for a license and i get steady updates regardless what the existing exchanges do to their platforms .... what can i say? Hey guys just got a raspberry pi 3 to run LeonArdo. I’ve been running on my win10 laptop but I’m a total newb with pi. Can someone just give a quick tutorial on how to download and install LeonArdo on the Pi using raspbian? Really appreciate it in advance. Thanks! Here's how I installed leonArdo on my Pi. You need to go to the Raspberry Pi website and download the lastest Raspbian OS and follow instructions on how to copy the OS on to your Sd card. When will we finally get a log of transactions leonardo makes? I asked for it some time ago and as leonardo already creates tons of logs .. what is so hard on just writing it to a consistent single file as simple CVS data? Oh .. and do we already have some commandline option to specify where it should look for it's config or where to write his data? 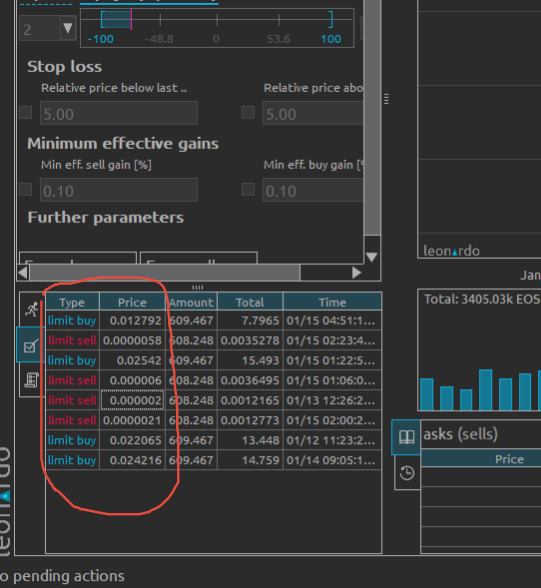 I still have a separate instance of leonardo for every single exchange so that any crashing leonardo does not crash all others for the other exchanges (which is a really bad hack to do for a software which costs this much money!) and i want to not have to hack it further to just get such _very simple and basic things_ done on my systems. Any updates on these really small feature requests? (Why do i have to ask again for that? What about a public bug-tracker or feature request thingie where people can track what's going on and can see and estimate when some specific thing might be done??). On _any_ strategy, please include in the status message of the strategy on which cycle (sell/buy) a margin maker strategy is for example. Even on the Ping Pong one would it be nice to see what it is actually doing/waiting for. On some markets a strategy can stay in a specific cycle for a longer time, which is ok, but hard to get an overview if the last trades happened some few hours ago and you have to adapt your graphs to be able to find and compare them against the actual market.. Some of you may remember that I had some complaints regarding runtime errors a couple of weeks ago. In my case the issue appears to be resolved with the current build. I have also spoken to Jonathon regarding this and he assures me that a 64 bit version for windows is a high priority which should resolved the issue completely. Just updating for the sake of fairness.